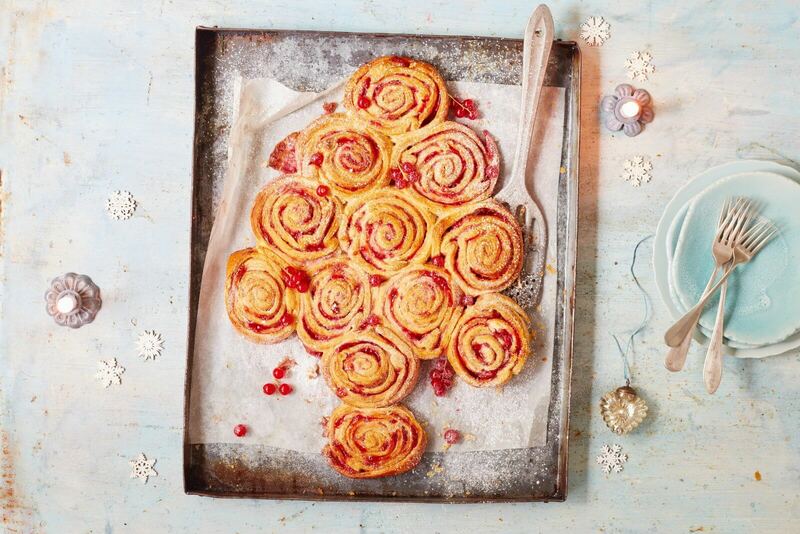 Delicious jam rolls with a twist. And what is more festive than this Christmas tree on the table during Christmas brunch? Big enough to share with the entire family! Preheat the oven to 180/200C degrees. Open the first can and roll out the dough on your kitchen counter. Press the cutting lines together and spread the 6 tablespoons onto the dough. Roll the dough back up and cut the dough in 6 smaller rolls. Repeat these steps for the second can. Place the rolls onto the oven tray covered with baking paper. Use 10 rolls for the tree and 2 for the stem. Bake the Christmas tree for 20 minutes until golden brown. Use some powdered sugar and currants as garnish.